← Why Startup Founders Are Always Sad. A Rare Glimpse into Me Off the Bike! Driving In Traffic- Dangerous but I Love it! Yet another post that my mom will love! 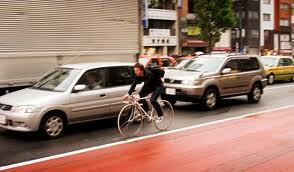 If you ride a bike, you have to deal with riding in traffic. It’s a fact of life that we all must get used to. I just happen to really enjoy it, I don’t know why but I do. But I must preface this statement with some conditions. I must feel good, be in no particular rush, and not be carrying too much stuff(under 20 pounds of gear and cargo). Nothing gives me more pleasure than those times when the city is a bit congested and I can just peddle my way through it and make all the drivers crazy because they know I’ll get where I’m going across town faster than them. There’s a certain rush that comes from traveling with the cars as their top speed is 15 mph and you can just buzz right past them and go through intersection after intersection when each light turns green. All they can do is feebly watch and concentrate on the brake lights in front of them. To all the drivers, don’t feel bad. When the tables are turned, I hate me too. Me being the bikes whizzing past as I inch along in traffic for no reason. This entry was posted in Bike commute, brad on a bike, Car Free, carfreebrad.com, Urban Bike and tagged Cycling, National Highway Traffic Safety Administration, Pedestrian, Traffic, Traffic light. Bookmark the permalink. 1 Response to Driving In Traffic- Dangerous but I Love it! Thanks for checking out my blog and following! I hope to be ‘car free’ in the near future, so I was very excited to come across your blog!